Hello , people in Somerset with learning disabilities can now get computer and internet training through ‘Your IT Now’. ‘Your IT Now’ is a service based in Somerset that has been set up by Alex Roland to enable people with a Learning Disability, to access the internet and information technology with help from our training and support program. We specialise in Technology support and online safety as well as Facebook and social media skills and safety . ‘Your IT Now’ works to empower people of all abilities and levels to use the vast wealth of resources and services the internet can offer, be that information, social networks, games, e-mail or anything else the personrequires. We also offer full one to one care and support packages for help with general life skills and all social aspects of life. Everything from help learning to catch a bus to banking and trips out. We have offices in Bridgwater at 34A St Mary Street TA6 3LY please ring if youd like to visit us there. So you want to be a care-micro provider? 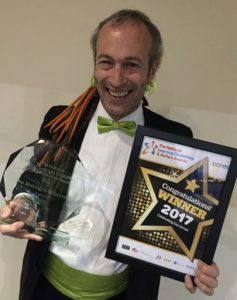 Your IT Now win at National Learning Disability and Autism Awards 2017!